La Vallarta wasn't very busy when the boys showed up for lunch. They were served up a basket of the thick yellow chips probably from a bag. The guys are really partial to thin chips made right there in the restaurant. The salsa was pretty good with some nice heat to it. Beef enchiladas were ordered and came out in good time. The enchiladas were decent with a beef filling that was well spiced and flavorful. They were not overly spicy but had a mellower flavor that was subtle. The sauce was more yellow than the traditional red but the flavor was good. 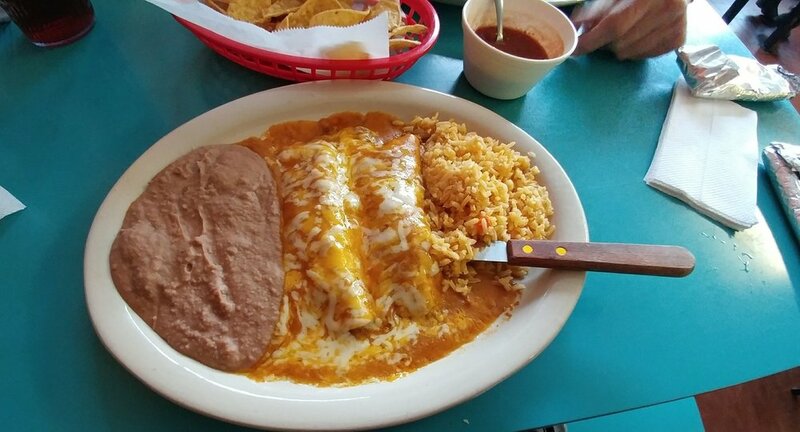 These enchiladas were on the smallish size and could have used some more filling. The rice was fairly bland but had a similar subtle flavor to the enchiladas. The refried beans were disappointing with Rusty finding them downright bad.